Two flip-flops, four plastic bottles, 25 plastic bags and 115 plastic cups were found in a dead sperm whale washed ashore in Indonesia. 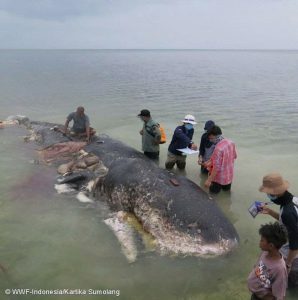 A thousand pieces of plastic debris were found in the stomach of an endangered sperm whale that washed up in Indonesia recently. Officials found 19 pieces of hard plastic, four whole plastic bottles, 25 plastic bags, two flip-flops, 115 plastic cups and 1000 pieces of plastic string, according to the World Wildlife Federation. In all, the plastic contents of the whale’s stomach weighed 13.2 pounds. Indonesia ranked second, behind China, on a list of the top 20 worst ocean plastic polluters in a 2015 study. The sperm whale was the second whale to wash ashore with a stomach full of plastic in recent months. Last June, a dying pilot whale was found in near the Malaysian border. Just before the whale died, it spit out five plastic bags. An autopsy revealed another 80 bags and other plastic trash weighing 17 pounds. Indonesia’s minister of maritime affairs told the Associated Press that the government aims to reduce the country’s plastic consumption 70 percent by 2025. He said the government has already urged shops to stop providing plastic bags to customers.